Not to be confused with List of capitals in the United States. This is a list of state and territorial capitols in the United States, the building or complex of buildings from which the government of each U.S. state and District of Columbia along with organized territory, exercises its authority. While most states (39 of the 50) use the term "capitol" for their state's seat of government, Indiana and Ohio use the term "Statehouse" and eight states use "State House": Maine, Maryland, Massachusetts, New Hampshire, New Jersey, Rhode Island, South Carolina, and Vermont. Delaware has a "Legislative Hall". The State of Alabama has a State Capitol, but the Legislature has, since 1985, met in the State House. A capitol typically contains the meeting place for its state's legislature and offices for the state's governor, though this is not true for every state. The legislatures of Alabama, Nevada, and North Carolina meet in other nearby buildings, but their governor's offices remain in the capitol. The Arizona State Capitol is now strictly a museum and both the legislature and the governor's office are in nearby buildings. Only Arizona does not have its governor's office in the state capitol, though in Delaware, Ohio, Michigan, Vermont, and Virginia, the office there is for ceremonial use only. Eleven of the fifty state capitols do not feature a dome: Alaska, Florida, Hawaii, Louisiana, New Mexico, New York, North Dakota, Ohio, Oregon, Tennessee, and Virginia. 1994 (expansion of east wings) 70 (est.) The Old Statehouse, used from 1792 to 1932, is listed on the NRHP. ^ "Virtual Tour of the Virginia State Capitol". Virginia Capitol.gov. May 2011. Retrieved January 16, 2019. ^ "State Capitols and Domes". NCSL.org (National Conference of State Legislatures). Retrieved October 9, 2013. ^ Daniel, Jean Houston; Daniel, Price (1969). Executive Mansions and Capitols of America. Waukesha, Wisconsin: Country Beautiful. p. 145. ; "Alabama State Capitol, Montgomery". Retrieved September 22, 2013. ^ "Alaska State Capitol, Juneau". SkyscraperPage.com. Retrieved September 21, 2013. ^ "Original Arizona State Capitol, Phoenix". SkyscraperPage.com. Retrieved September 21, 2013. ; The branches of the state government have relocated from the original capitol to adjacent buildings and additions. ^ "Arkansas State Capitol, Little Rock". SkyscraperPage.com. Retrieved September 21, 2013. ^ "California State Capitol, Sacramento". SkyscraperPage.com. Retrieved September 21, 2013. ^ "Review of Colorado State Capitol". Frommers. Retrieved September 21, 2013. ^ "Connecticut State Capitol and Legislative Office Building" (PDF). Government of Connecticut. Retrieved September 21, 2013. ^ "New Florida State Capitol, Tallahassee". SkyscraperPage.com. Retrieved September 21, 2013. ^ This appears to be an estimate that is used in Hawaii. "Cupolas of Capitalism". Cupola Consulting. Retrieved September 29, 2013. ^ "Idaho Capitol Building". Idaho Public Television. Archived from the original on June 11, 2015. Retrieved September 21, 2013. ^ "IL State Capitol". Historic Sites Commission of Springfield, Illinois. Archived from the original on May 12, 2012. Retrieved September 21, 2013. ^ "IDOA: The Statehouse Story". IN.gov. Retrieved May 19, 2010. ^ "Indiana's Third State Capitol Building Design Released to the Hoosier Public". Indiana Historic Newspaper Digitization Project. Archived from the original on November 15, 2013. Retrieved September 21, 2013. ^ "Capitol Facts". The Iowa Legislature. Archived from the original on August 14, 2013. Retrieved September 21, 2013. ^ "Kansas State Capitol, Topeka". SkyscraperPage.com. Retrieved September 21, 2013. ^ "Capitol, Frankfort". SkyscraperPage.com. Retrieved September 21, 2013. ^ "The Louisiana State Capitol Building". State of Louisiana. Archived from the original on September 8, 2013. Retrieved September 21, 2013. ^ "The State House". State of Maine. Retrieved September 21, 2013. 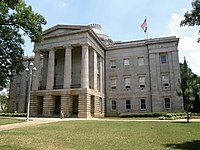 ^ History of the State House and Its Dome. msa.maryland.gov (Maryland State Archives), 2007. Retrieved on April 5, 2014. ^ "The Maryland State House". State of Maryland. Retrieved September 21, 2013. ^ Kerry Chartkoff (February 28, 1992). "National Historic Landmark Nomination—Michigan State Capitol" (pdf). National Park Service. ^ "Facts About the State Capitol". Minnesota Historical Society. Retrieved September 21, 2013. ^ "Mississippi State Capitol". Mississippi State Legislature. Retrieved September 21, 2013. ^ "Missouri's State Capitol". Missouri Secretary of State. Retrieved September 21, 2013. ^ "Montana State Capitol, Helena". SkyscraperPage.com. Retrieved September 21, 2013. ^ "Nebraska State Capitol". Nebraska State Government. Retrieved September 21, 2013. ^ "Nevada State Capitol, Carson City". SkyscraperPage.com. Retrieved September 21, 2013. ^ Norma Love (July 14, 2013). "N.H. Statehouse Dome Getting a Golden Makeover". Concord Monitor. Archived from the original on December 6, 2015. Retrieved September 21, 2013. ^ "New Jersey State House, Trenton". SkyscraperPage.com. Retrieved September 21, 2013. ^ Estimate based on photograph. ^ "New York State Capitol, Albany". SkyscraperPage.com. Retrieved September 21, 2013. ^ "Capitol". North Carolina Department of Public Instruction. Archived from the original on August 31, 2012. Retrieved September 21, 2013. ^ "History of the State Capitol Complex". North Dakota State Department. Retrieved September 21, 2013. ^ "Ohio Statehouse". State of Ohio. Retrieved September 21, 2013. ^ "Capitol, Oklahoma City". SkyscraperPage.com. Retrieved September 21, 2013. 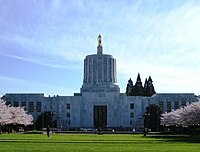 ^ "Oregon State Capitol". Oregon Encyclopedia. Retrieved September 21, 2013. ^ Caffin, Charles Henry (1906). Handbook of the New Capitol of Pennsylvania. Harrisburg: Mount Pleasant Press. p. 13. Retrieved September 21, 2013. ^ Parker, J. Fred (1914). State of Rhode Island Manual. Providence: State of Rhode Island. p. iii. Retrieved September 22, 2013. ^ "Tour Outside the State House (The State House)". State of South Carolina. Archived from the original on April 26, 2014. Retrieved September 22, 2013. ^ "The South Dakota State Capitol Building". State of South Dakota. Retrieved September 22, 2013. ^ "Not-so-ordinary State Capitol is 150". Associated Press. Retrieved September 22, 2013. ^ Green, William Elton (December 2, 2015) [June 12, 2010]. "Capitol". Handbook of Texas (online ed.). Texas State Historical Association. ; "Texas State Capitol, Austin". SkyscraperPage.com. Retrieved September 22, 2013. ; "Capitol Views". City of Austin Library. Retrieved September 22, 2013. ^ "Utah State Capitol Building". Utah Travel Industry. Archived from the original on October 11, 2013. Retrieved September 22, 2013. ^ "Vermont State House, Montpellier". SkyscraperPage.com. Retrieved September 22, 2013. ^ "Cupolas of Capitalism". Cupola Consulting. Retrieved June 20, 2014. ^ "Capitol Facts & History". Washington State Department of Enterprise Services. Retrieved September 22, 2013. ^ James E. Harding (April 11, 1974). "National Register of Historic Places Inventory-Nomination: West Virginia Capitol Complex / West Virginia State Capitol, West Virginia Executive Mansion" (PDF). West Virginia Capitol Complex. State of West Virginia, West Virginia Division of Culture and History, Historic Preservation. Retrieved September 22, 2013. ^ "State Capitol Building". Wisconsin Department of Administration. Retrieved September 22, 2013. ^ "Wyoming State Capitol Field Trip". Wyoming State Historical Society. Retrieved September 22, 2013. Cupolas of Capitalism State Capitol Building Histories. Cupola.com. This page was last edited on 16 January 2019, at 13:30 (UTC).